Chef Alex Hong comes by his love of the offbeat ingredient sorrel honestly: He’s the executive chef at a restaurant by the same name in San Francisco. Makes enough sauce for 12 oysters. For the mignonette: In a bowl, mix together the lemon, pear, shallot, vinegars, sugar, and salt. 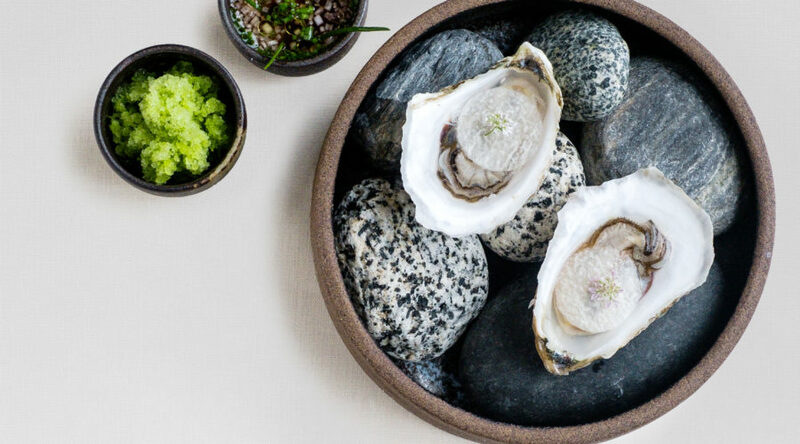 Garnish oysters with sorrel ice, jicama, and wood sorrel and coriander flowers, if using. For the sorrel ice, make a simple syrup: Bring 2 cups water, the sugar, and lemon juice to a simmer. Steep mint and lemongrass in simple syrup, and chill to room temperature. Discard mint and lemongrass. Purée simple syrup, ice, salt, and French sorrel on high and strain through a sieve. Transfer to a shallow bowl and freeze overnight. Scrape with a fork to achieve granita consistency.